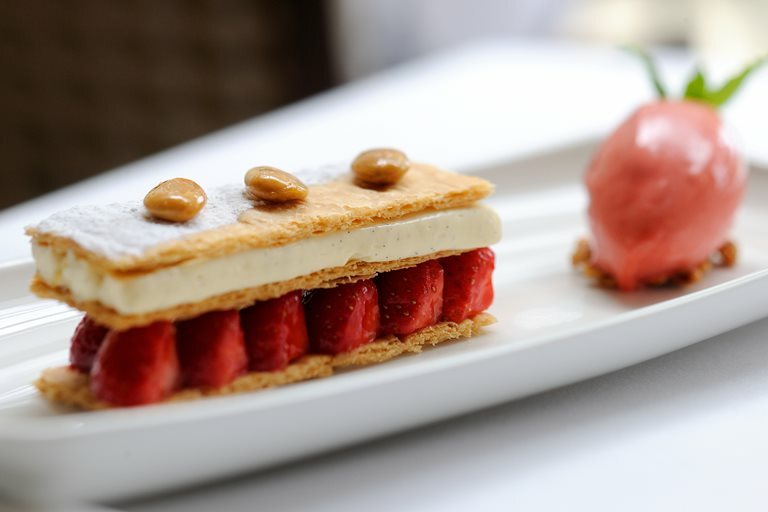 This strawberry mille-feuille recipe from Stephen Crane is as elegant a dessert as you can find. Mille-feuille does require a bit of effort, but it does taste as as good as it looks, so this summer dessert is worth the preparation. The custard-filled pastry is served with an English strawberry sorbet. You can find more sweet treats in our dessert recipes collection. As head chef of the idyllic Ockenden Manor in the countryside of Sussex, chef Stephen Crane cooks refined, French-influenced food, and given his pedigree, that’s no great surprise.